We are who we are or – are we defined by what we do and the environment that we function in? Look into a person’s eyes and you can determine quite a bit. A cook’s eyes are focused, tired, often bloodshot, determined, aware of what is happening on the periphery, wanting, questioning, confident and a bit fearful at the same time. These are the eyes of a complex being – a person who is fully aware of what he or she must do, but not always certain about who they are or whom they could be. A cook’s eyes are challenging yet subservient; open, but cautious; sharp yet blurred to those things that might pull them away from a designated task; in search of excellence, yet knowing that excellence is something that might never be reached; and alert, but oblivious to everything but that pan or pair of tongs in their hands. Servers might view some line cooks as cold and calculated, crusty and ego driven, confident and unwilling to admit mistakes, and abrupt and even sometimes obscene. The fact is all these characteristics can be dispelled by looking into a cook’s eyes. All of these surface traits are but a façade that allows a cook to be successful in the moment, suffer and enjoy at the same time, avoid the looming anxiety that comes from a hundred mistakes waiting to rear up their ugly heads, and the loss of confidence that is inevitable when those mistakes come to light. Let’s look at the haze of existence that is the cook’s life, the factors that sit on a cook’s shoulders waiting to nip away at confidence, and the reason why most line cooks build a wall of protection around their being. The business is difficult, the work is physically, mentally, and emotionally challenging, the hours are brutal, the heat is intense, and the stress is everywhere. If a cook is to rise above the fray and make it through a shift then he or she has to at least appear to be unwavering and in control. This tough as nails persona is truly a survival tool. Of course there are many other careers that are just as physically difficult, but somehow the line cook’s job seems to be a bit more relentless. On your feet for 10-12 hours without much release, constant lifting, reaching, bending, grabbing, and then morphing into a detail artist painting on the plate is hard to describe. Cooks, as tough as they seem, crave that occasional thumbs up, pat on the back, or simple “great dish” statement from a peer, sous chef, chef, or guest. Even more importantly, these cooks want to belong to the club of acceptance. The club that seasoned cooks and servers are card carrying members of, the club that welcomes a line cook for his or her proven abilities. Some cooks have it, but many do not – that something special, a gift – the palate that can distinguish nuances of flavor and the knowledge to be able to adjust preparations to reach a certain flavor goal. Those who have it are special, those who don’t – feel the need to put in more effort, work even harder to try and compensate. Hero today – failure tomorrow – cooks cannot rest on an occasional compliment, they must always remain aware that their effectiveness and worth to the operation depends on great work and excellent food every time. There is little margin for error. I remember a concert that Joni Mitchell gave once where she admonished the need to constantly present the same songs over and over again in a manner that attests to a singer’s brilliance. Her quote was: “No one ever asked Van Gogh to pain a Starry Night Again!” Yet in a kitchen, every time a cook prepares a dish – often the same dish he or she has built hundreds of times before, he or she is expected to do so with brilliance and consistency. Each dish carries the signature of a cook’s reputation. Each dish carries a silent message that states: “Here it is- this is my work – this is the best that I can do”. As I have stated before, when you reach a level of competence in the kitchen you become spoiled for any other type of job. 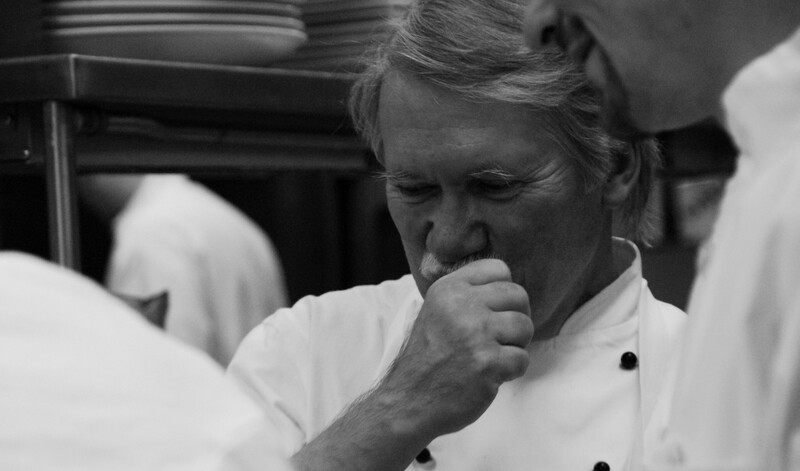 The adrenaline, the creativity, the dependence on team, the predictable unpredictability of the position, the heat, the intensity of the work, and the connection to a time honored process of cooking can be quite intoxicating. The love/hate relationship with cooking makes it apparent that there are few other jobs that can pull a person in so many different directions. Cooking is a team sport. If nothing else – every cook learns quickly that his or her role is essential to the success of every other team member. The last thing that any cook would do is let down the person to his or her right or left. Many would not understand that emotions run very high in a kitchen. The desire to please and represent their own work as well as that of the restaurant will keep most cooks on edge as they struggle to keep their emotions of fear, passion, anger, happiness and despair in check every shift. That drink or two at the end of the shift serves a purpose of bringing those emotions back under the umbrella of constraint. Some will point to those cooks who are quick to anger – the visual display of what appears to be contempt or the lashing out with dragon eyes becomes the way that some might describe those who work in the pressure cooker of the kitchen. In reality, this anger is many times an inappropriate tool used by some cooks to avoid looking at their own missteps, a way to deal with their lack of preparedness or organization. This is not to excuse their behavior, but rather to separate the cause from the effect. Tired, hot, emotionally drained, pleased with results or self-loathing over a less than stellar job, embarrassment when they let down a team member, or that occasional dissatisfied guest comment – cooks know that somehow they must put all of that aside by tomorrow. Each day a cook will start fresh with equal opportunity to succeed or step awry. In the end, cooks know in their heart that excuses are just excuses and bare no relevance to the end goal. Don’t point fingers unless the target is you. Maligning others or wallowing in the impact of mistakes will get the cook nowhere. No excuses – fix it and get the job done. ***FOLLOW www.harvestamericacues.com BLOG and SHARE these articles with your network of friends.